shine brite zamorano: tweet tweet. I thought it would be nice to do a project full of color and life with the 1st graders this week. 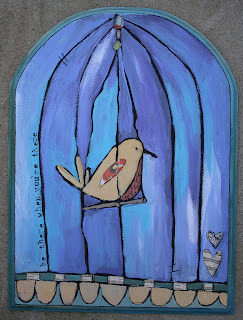 An image I found by artist and fellow art educator Jenni Horne was just the ticket! I showed the kids her website, but before they got to see the painting we were going to paint, I filled them in on Jenni's love of yard sales and thrift stores. Sometimes I buy stuff that I really shouldn't. Yep. I see it at a yard sale or thrift store and think to myself, "maybe I could paint on that?" These wooden panels were such an example of my binge buying. I found them at a yard sale for a steal but they sat....sat....sat....perhaps even got moved to the storage unit sat...until recently I looked at them and it hit me. They looked like a BIRD CAGE! And voila! A painting series began. I drew the shape of the panel on the board and asked the classes what it reminded them of. I got tunnels, tombstones, popsicles, castle windows, but no bird cages. I then let them see what Jennie made. 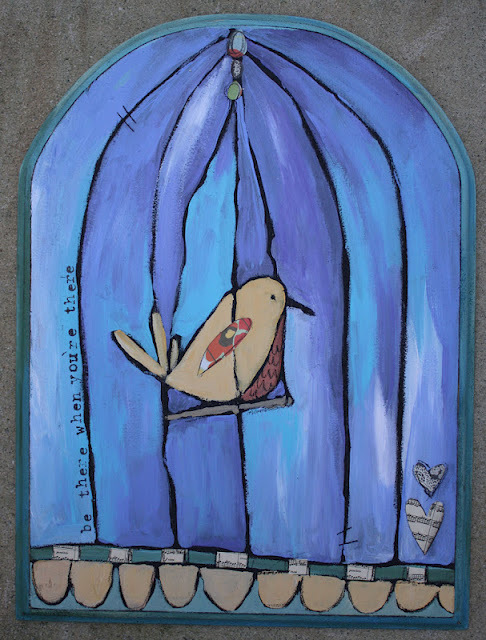 The classes loved seeing her series of bird cage paintings. We discussed her use of simple patterns and outlines to define shapes. There were 5 simples steps when the kids made their own paintings. The kids did a fantastic job with this project. So many different colorful variations on a common theme. Well done kids! Thanks Jennie for providing such a cheerful subject for the kids to continue their exploration of pattern and paint application. You are always one(actually, MANY)step ahead of me, D. I have been collecting images of birdcages for quite awhile hoping to squeeze a project in before vacation. With only 9 days left however, I think it'll have to wait until fall. Your students did a wonderfully colorful,impressionistic project. Quite fun to look at all of the different birds! I love this!!! I just may have to do this project with my kiddos next year too. Thanks for sharing my work with your young ones. I love knowing that I can inspire all ages!